Meat and cheese, a simple and timeless combo. Sandwiches are a bigger restaurant category now than they have ever been. Better ingredients are crucial to making them memorable. 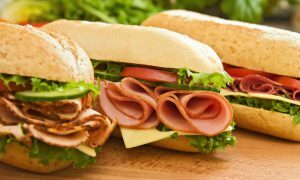 Tillamook cheese, Hill’s ham, Butterball turkey, and Royal Crown New York style pastrami are among the brands that will spur your customer to return again and again. We offer a wide range of cheeses in blocks, slices and crumbles to compliment these outstanding cold cuts. Specialty cheeses such as smoked gouda, Danish blue, chevre, imported parmesan and fontina are available as are many others via special order. Corned beef briskets never go out of style and ours will make your mouth water. We carry an extensive line of Molinari Salame, the legendary brand from San Francisco, and an absolutely excellent 14 month aged prosciutto from Italy. Whether you need a lunch sandwich special or a show stopping charcuterie board, we have the best products from the best producers to choose from. Tastes and dining trends tend to evolve over time but quality is never trendy and always in good taste. The deli line at Columbia Empire is the place to find dependably excellent products.